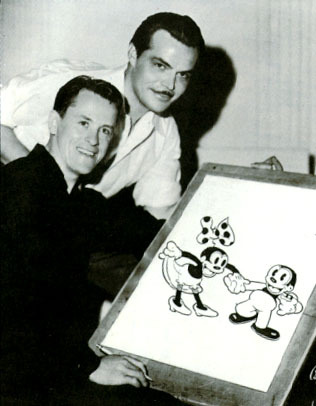 Hugh Harmon and Rudy Ising created Bosko and founded the animation studios for Warner Bros. and MGM. Rudolph or Rudolf “Rudy” Ising (August 7, 1903 – July 18, 1992) was an Academy Award-winning animator. Ising was born in Kansas City, Missouri, and started his career in the early days of Walt Disney’s Laugh-O-Gram Studio. Ising and his partner Hugh Harman went on to found the animation divisions of Warner Bros and MGM. Harman’s brother Fred worked with Walt Disney at the Kansas City Film Ad Company. When Disney left to start his own animation company, Laugh-O-Gram Studio, Fred was his first employee. When the studio hired additional local animators, including Rudy and Hugh Harman were among them. Laugh-O-Gram Studio eventually went bankrupt. Disney left for California, but Ising, Harman, and Carmen Maxwell stayed behind, attempting to start their own studio. Eventually, however, they made the move to California and worked for the Walt Disney Studio. Harman and Ising left Disney when the studio lost the rights to Oswald the Lucky Rabbit. They joined the studio producing new Oswald cartoons. After they were forced out by a shake up at the company in 1929, Harman and Ising developed the character Bosko with the help of Friz Freleng. Bosko impressed Leon Schlesinger who brought the animators to Warner Bros. Harman and Ising built the new animation studio with Looney Tunes and Merrie Melodies cartoons. In 1933, Harman and Ising moved briefly to Van Beuren Studios. In 1934, they signed a deal to produce cartoons for MGM, including new Bosko cartoons. That relationship lasted through 1937. Harman and Ising began freelancing as animators, working both together and apart through the rest of their careers.